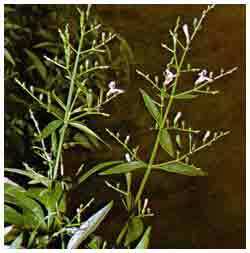 Description: It is an erect, branched annual herb with four angled branches and lance shaped very bitter leaves. The plant bears small, rose coloured flowers in large, spreading open bunches. How to Grow: It is an annual herb and, therefore, needs to be planted afresh every year. Two plants on the ground or in pots of the size 20-25 cm are adequate for a home herbal garden. Care regime: The plant can withstand partial shade for a few days and needs watering two-three times a week for its optimum growth. It regenerates easily from seeds. Dry mature seeds sown in nursery bed or pot germinate in about ten days and establish as seedlings. It can also be multiplied through 10-15 cm long semi-mature stem cuttings. Collection: The plant becomes ready for first harvest of its leafy branches in about a month of its planting and these can be cut with the help of knife. Harvest of leafy branches can be continued till the plant completes its annual life cycle.